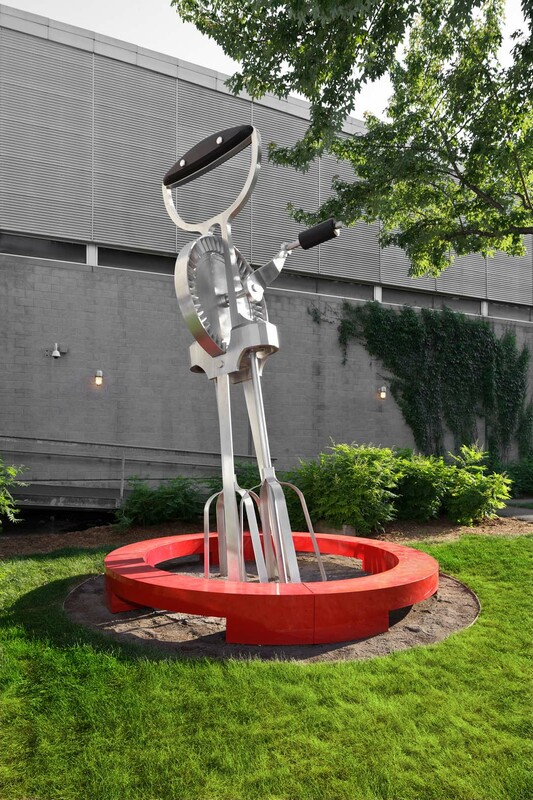 The “eggbeater” is situated in a space adjacent to the rear entrance to Centre Jean-Claude-Malépart, along Avenue Gascon. 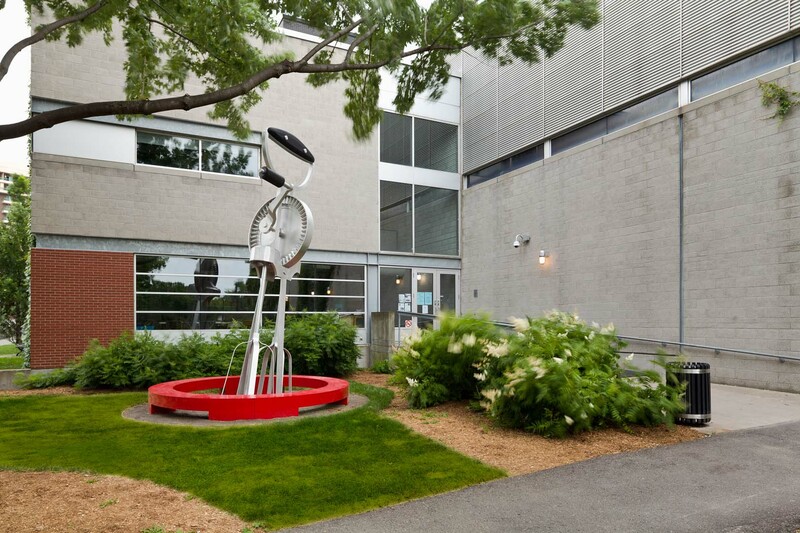 In this position, the artwork marks the presence of the centre, consolidating its link with the neighbourhood. Around the oversized kitchen implement is a circular red bench providing a place to sit and chat. Thus, this everyday object encourages people to meet and mingle. Like an eggbeater that incorporates ingredients, Centre Jean-Claude-Malépart brings together the residents of the Sainte-Marie neighbourhood. In this sports and community centre, “the whole” is in the image of its parts – a mixture of ages, cultures, and interests. This artwork was produced in the context of expansion of Centre Jean-Claude-Malépart. The project, completed in 2010, consisted of construction of an indoor swimming pool and wading pool. The artists Jean-François Cooke and Pierre Sasseville live and work in Québec City, where they are known for the originality and relevance of their creations. Over the years, the duo has produced a number of large-scale projects, exploring a multitude of materials and a wide variety of techniques. Their art is marked with humour that is sometimes absurd, sometimes hard-hitting or cynical, drawing on themes that involve everyday concerns. 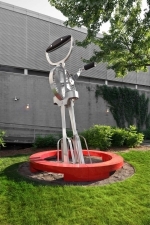 Cooke-Sasseville’s work, based mainly on sculpture and installation, has been exhibited in a number of Québec galleries. They have presented their work in more than 10 solo exhibitions and participated in 20 major group events in Québec and Europe. 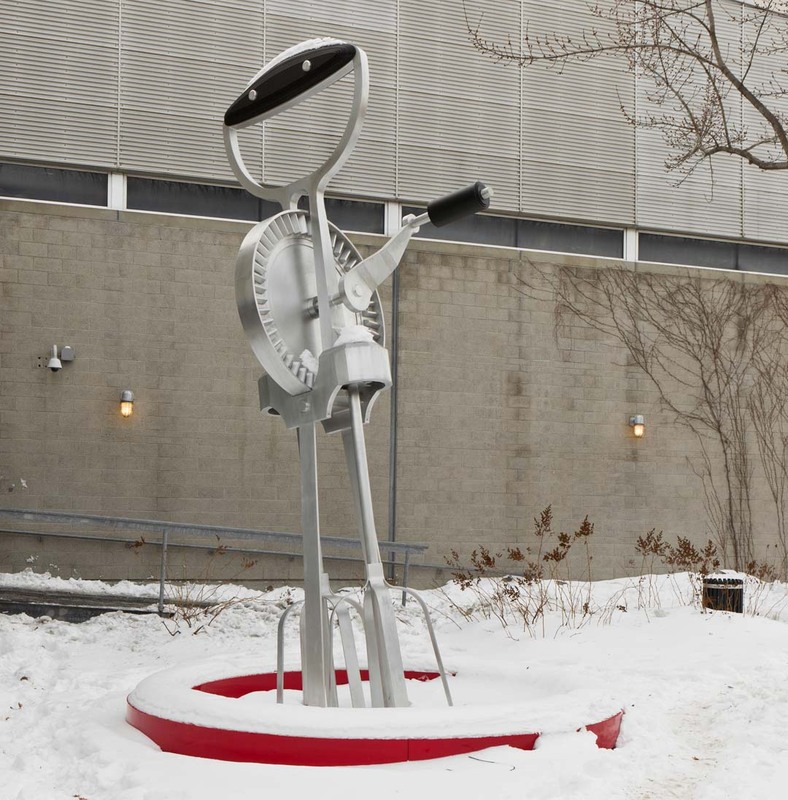 They have created a number of works of public art, including Point de mire (2011), in Thetford Mines, and Le Mélomane (2011), which is in the Ville de Montréal’s collection of public art.